WASHINGTON (Reuters) - President Donald Trump on Wednesday called U.S. intelligence chiefs "extremely passive and naive" on Iran and dismissed their assessments of the threat posed by North Korea a day after they contradicted his views during congressional testimony. Leaders of the U.S. intelligence community told a Senate committee on Tuesday that the nuclear threat from North Korea persists and that Iran is not taking steps toward making a nuclear bomb, conclusions that contrasted starkly with Trump's assessments of those countries. "The Intelligence people seem to be extremely passive and naive when it comes to the dangers of Iran. They are wrong!" Trump, whose has criticized U.S. intelligence agencies starting even before he took office, said in a Twitter post. Trump cited Iranian rocket launches and said that Tehran was "coming very close to the edge." "Perhaps Intelligence should go back to school!" Trump said. Trump last year pulled out of an international nuclear deal with Iran put in place under his Democratic predecessor Barack Obama, saying Tehran was "not living up to the spirit" of the agreement, and re-imposed sanctions. Under the 2015 deal, Iran agreed to restrictions on its nuclear activities in exchange for the lifting of sanctions. 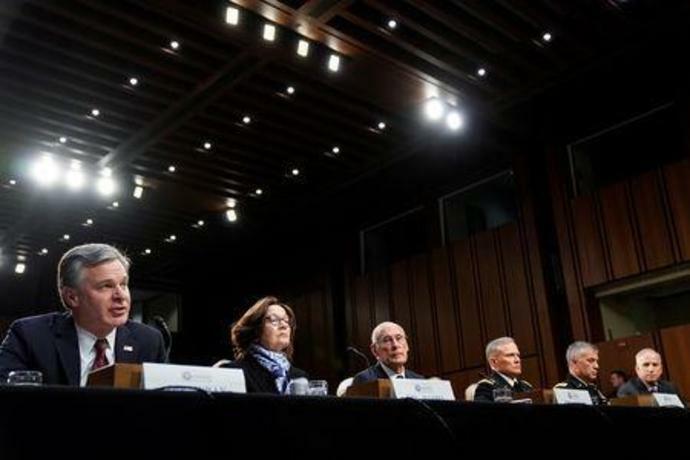 The U.S. intelligence officials told the Senate Intelligence Committee that Iran was not developing nuclear weapons in violation of agreement. Their assessments also broke with other assertions by Trump, including on the threat posed by Russia to U.S. elections, the threat that the Islamic State militant group poses in Syria and North Korea's commitment to denuclearize. "The President has a dangerous habit of undermining the intelligence community to fit his alternate reality," Senator Mark Warner, the Intelligence Committee's top Democrat, wrote on Twitter. "People risk their lives for the intelligence he just tosses aside on Twitter." Republican U.S. Representative Mike Gallagher, who served as a Marine Corps intelligence officer during the Iraq war, defended the intelligence agencies, saying, "They are doing a very difficult job and they are actually trying to advance the president's priorities." Trump has challenged U.S. intelligence agencies' findings in the past, including casting doubt on their conclusion that Russia interfered in the 2016 U.S. election with a campaign of hacking and propaganda to help him win the presidency. Former CIA Director John Brennan last year called Trump's performance at a joint news conference with Russian President Vladimir Putin "nothing short of treasonous" after Trump seemed to give credence to Putin's denial of Russia meddling in the 2016 election. In retaliation, Trump revoked Brennan's security clearance. On Wednesday, Brennan called Trump's refusal to accept the intelligence assessments a sign of "intellectual bankruptcy." "North Korea relationship is best it has ever been with U.S. No testing, getting remains, hostages returned. Decent chance of Denuclearization," Trump said on Twitter. "I look forward to seeing Kim Jong Un shortly. Progress being made-big difference!" Trump also defended his decision to withdraw 2,000 U.S. troops from Syria on grounds that Islamic State no longer poses a threat, saying "we've beaten them." Trump has given the Pentagon about four months to withdraw U.S. troops from Syria, backtracking from his abrupt December order for a pullout within 30 days. The U.S. intelligence chiefs said the Islamic State group would continue to pursue attacks from Syria and Iraq against regional and Western adversaries, including the United States.